The organizers of Be Kind to Animals Week® & Humane Sunday found many creative ways to not only spread the word about the events, but to convey a broader message of compassion towards all species. During the early decades of the 20th century, one of the many items that carried these messages were specially-designed blotters, available from groups like the American Humane Education Society (AHES) at a price of 50 cents for 100. 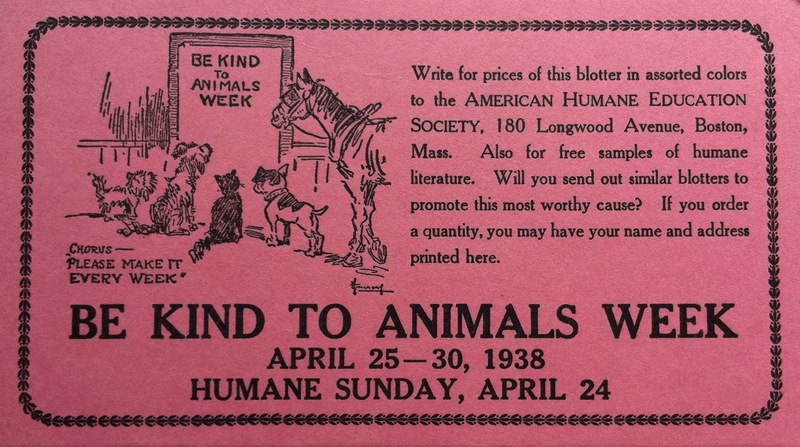 Blotter promoting Be Kind to Animals Week®, 1938. Collection of MSPCA Angell. In the 1942 example even more species of animals are represented: birds, a butterfly, a cat, a horse, a dog, a turtle, and a rabbit. 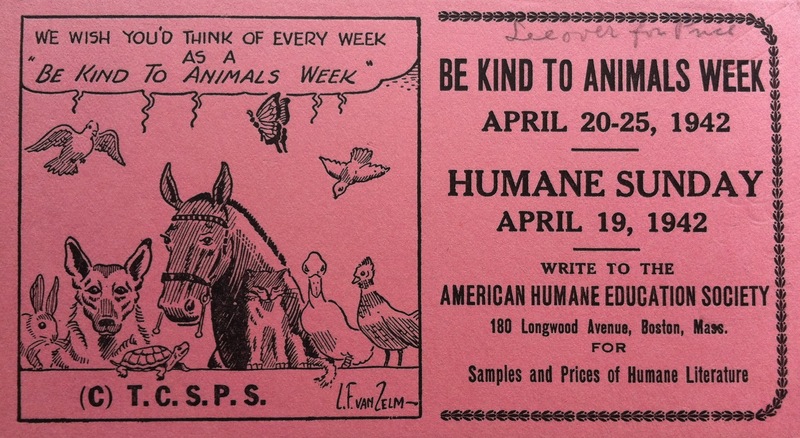 As was the case with the previous image, these animals are collectively making a plea to those who viewed these blotters: “We wish you’d think of every week as ‘Be Kind To Animals Week. '” This image was also used as one of four cartoon panels that appeared in Our Dumb Animals in June of 1941. In both of these instances it is important to note the representation of these animals as having the ability to speak. First of all, this kind of representation can serve as an important reminder that nonhuman animals share many characteristics with us. While the ability to speak English may not be one of them, the ability to communicate and the desire to be treated kindly most certainly are. The representation of nonhuman animals speaking our language may, indeed, be a leap here. No doubt many who viewed this kind of image read it as a comical representation, funny precisely because nonhuman animals do not speak English. And yet there is a further symbolic significance here that we must take note of. As art historian Steve Baker has argued, this kind of image can be very effective in animal advocacy because of the ways in which expected patterns of interactions between humans and nonhuman animals are disrupted. In his book Picturing the Beast Baker points out that that even the act of imagining a “talking animal” introduces “disruptive potential” (139). This “disruptive potential,” in turn, can be a powerful agent of change when it comes to rethinking dominant ideas about the relationships between human and nonhuman animals.